Achieving one milestone after another, Senheng Electric (KL) Sdn Bhd is not taking a breather any time soon. The retail chain has just recently launched its very own telco line called Senheng Mobile at Sports Arena Sentosa, Kuala Lumpur. A subsidiary of Senheng Electric (KL) Sdn Bhd, Senheng Mobile now joins the telco family in the country, with the aim of providing its customers a platform to connect and communicate anytime and anywhere. Collaborating with redONE Network Sdn Bhd, Senheng Mobile is set to offer wider and faster network and coverage, with propositions such as limitless and free on-net calls between Senheng Mobile users; low monthly commitment starting from RM8; six supplementary lines for families to enjoy free voice calls; smart device bundle plans, low data charges and many other benefits. The highlight of Senheng Mobile is the Senheng EZ Credit Reward Rebate whereby users can enjoy up to 20% rebate on their monthly domestic usage in the form of EZ credits. Accumulated EZ credits can then be used to redeem any electrical products from Senheng or senQ outlets nationwide. Venturing into the telco line can be risky for Senheng as there are the big boys to compete with. However, Senheng Electric (KL) Sdn Bhd founder and managing director Lim Kim Heng is not worried. “Senheng Mobile is not our core business, but retail is. Our main objective of having Senheng Mobile is to create a community within the Senheng Group. “We also want to enhance customer and brand loyalty by improving our customers’ frequency to visit the Senheng and senQ stores through the EZ credits redemptions,” said Lim. He added that with this new innovation, they also aim to bring customers’ shopping experience to the next level as Senheng Mobile users will also be granted a digital badge for identification. “Also, moving forward, EZ credit points will be easily earned and accumulated from multiple platforms and multiple businesses. “This will be a whole new achievement for Senheng,” added the visionary Lim, who has bigger plans in the coming years. redONE chief executive officer Farid Yunus said they were excited about the collaboration and were looking forward to working with Senheng. “Currently, we have about 750,000 post-paid customers. We believe through this collaboration, we are able to grow to greater heights, at the same time, achieving one to two million customers in the next few years,” said Farid. To mark the launch of the new mobile plan, Senheng is having a special bundle offer of a Samsung Galaxy J1 Ace with Senheng Mobile plan at RM299. The Senheng Mobile’s post-paid plan is available to anyone who wishes to subscribe to the mobile plan and enjoy the benefits offered by Senheng. After the launch, guests and members of the media were given the opportunity to watch the Purple League badminton match between Petaling Badminton Club and Puchong United Badminton Club. 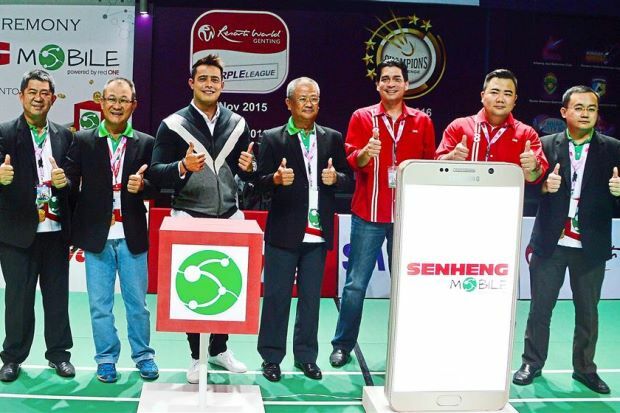 Senheng Mobile is also the supporter sponsor of Resorts World Genting Purple League 2015. Those interested can find out more at any outlet or visit www.senheng.com.my.